Beginning to discuss highly sensitive children health means understanding what a heightened sensory or other kinds of heightened experiences are and how they influence how a child perceives the world. Given the spatial embodied knowledge is vital to the experiences of highly sensitive people, we will begin by examining the nature of space at a molecular level. As we saw in chapter 5, everything that exists is made of energy, including us. In the article “what exactly is Higgs-Boson”, Jonathan Atteberry explains that the standard model of Modern particle physics has articulated that the universe doesn’t only contain matter; it also contains forces that act upon that matter. Along with particles, the standard model also acknowledges four forces: gravity, electromagnetic, strong and weak. As it turns out, scientists think each one of those four fundamental forces has a corresponding carrier particle, or boson, that acts upon matter. “ Some physicists have described bosons as weights anchored by mysterious rubber bands to the matter particles that generate them. Using this analogy, we can think of the particles constantly snapping back out of existence in an instant and yet equally capable of getting entangled with other rubber bands attached to other bosons (and imparting force in the process). This Higgs field, could affect different particles in different ways. Photons could slide through unaffected, while W and Z bosons would get bogged down with mass. In fact, assuming the Higgs boson exists, everything that has mass gets it by interacting with the all-powerful Higgs field, which occupies the entire universe. If these forces are what bind the world together, the nature of matter itself has been redefined. Physicists now understand that particles have no inherent mass, but instead gain mass by passing through a field. If the Higgs field generates energetic forces that are invisible to us, it is still the nature of space. One can assume this field functions similarly to other energy fields we know of, such as electricity. As Bernie Hobbs explains[ii], an electric charge always has an electric field around it, spreading out forever. If an electric charge moves, the electric field will move with it. No matter what speed the charge is moving at, its electric field will follow it at the speed of light, but it takes a tiny fraction of time for the whole field to catch up. If you make the charge move up and down (or side to side, or back to front) in a nice steady rhythm, the electric field around it forms waves – like the ripples on a pond – moving out in every direction at the speed of light. Whenever an electric field moves, it automatically creates a magnetic field that mimics its moves but at a 90 degree angle. The electromagnetic field travels as a wave just in the same way as light does. Our body generates electricity, and this ability is actually a key part of your achieving health. Electricity allows our nervous system to send signals to our brain. These signals are actually electrical charges that are delivered from cell to cell, allowing for nearly instantaneous communication. The messages conducted via electrical signals in our body are responsible for controlling the rhythm of our heartbeat, the movement of blood around your body, and much more. 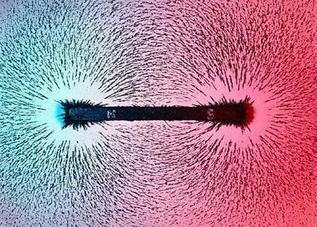 We are electrical beings and as such, we also create magnetic fields. We know that an electromagnetic field affects the behavior of anything with charge in the vicinity of the field. The image below illustrates the invisible signature of a magnetic field. It is quite plausible that the higgs field produces a similar invisible effect. These findings suggest that we are made of energy and forces, not matter, and that we are forces that exist in a field of energies and interact with other fields of energy. Given that the space is central to sensory life and that energy is core to space, the most fundamental element of sensory life must be energy. We need to consider that a highly sensitive child’s “being” is intertwined amongst many dimensions in interactions with these fields which have a subtle effect on the child; and that their well being depends in part on balancing the inter-relationship of energy to a number of other health determinants. Here lies a first difficulty; energy is the most difficult element to consider as it is invisible and depending on our belief systems (the social and cultural perspectives), it has more or less defined boundaries. Dealing with this level of health requires “detective” work as what is toxic can be without matter form, odor, visual, or any sensory element we are used to recognize. If you are ticklish, imagine these energetic forces tickling you constantly without any way of expressing your discomfort. Imagine not having the words to say this tickling is too strong and the adults around you not even knowing what tickling is. This is the dilemma heighted senses can create in a child. The simple acknowledgment of this spatial dimension can help us understand what a heightened sensorial being may be experiencing. Could these children sense these energetic fields, and without the proper social and cultural learning to interpret these signals, nor the vocabulary to describe them, they are unable to explain what these energetic sensations are and how they are affecting them. Their only conduit to expressing this distress is to “over” or “under” react, their behaviors being the only communication tool available to articulate their discomfort. Considering energy as vital to sensory health, its quality becomes important to well-being, this leads to examine the role of the environment on a child’s sensory experience as it shapes the positive or negative nature of that energy. Next: Experience of the Environment: Child, Family, Community and the world. [i] Atteberry, Jonathan (2012). “What exactly is the Higgs boson?”. How Stuff works. http://science.howstuffworks.com/higgs-boson2.htm.